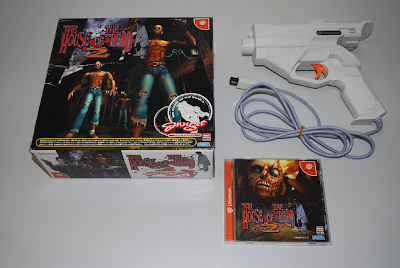 One for the Dreamcast enthusiasts: a House of the Dead 2 Gunset has made it to eBay, and the seller is nice enough to ship worldwide. Yes, despite this being the beautiful Japanese version of the box set. So tempting! And worldwide shipping, finally a little long-distance consideration. I've considered getting the full-sized upright of this game, though, so that $100 might want to go in that direction instead. Though, troubleshooting a Dreamcast is a lot easier than fixing...or moving...a 300 lb arcade gun game (from experience!). Easier indeed, but the proper arcade is, well, simply amazing and definitely worth the money and effort if you've got the space. Ahh, 'the space' - my old nemesis.